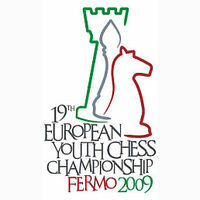 The European Youth Chess Championship 2009 will take place in Fermo, Italy, from 30th of August until 10th of September. It will feature the top young talents from Europe, divided into different age categories. Top rated players among the boys are GM Ivan Salgado Lopez and GM Ioan-Cristian Chirila. In the U16 group clear favorite is the Swedish talent IM Nils Grandelius, while the U14 group expects the big clash between FM	Bukavshin and FM Kiprian Berbatov. Top rated among the girls is the untitled Anastasia Savina from Russia (ELO 2382), who will be looking for norms at the European Youth Chess 2009. Her main competition comes from WGM Jovana Vojinovic and WGM Olga Girya . WIM Nazi Paikidze and WIM Irina Bulmaga are leading the U16 section. Below you will find full lists of the registered players until August 30. The organizers of the 19th European Youth Chess Championship in Fermo / Italy (31 August – 9 September 2009) expect around 900 participants. On Sunday, 30 August, the championships start with the opening ceremony at 10.00 pm in “Teatro dell’Aquila”. Stay tuned for full information on Chessdom.com!